As promised, here is my portion of the quick page blog hop for the Kimono Collab at Jessicasprague.com. Here is a link to the kit itself. 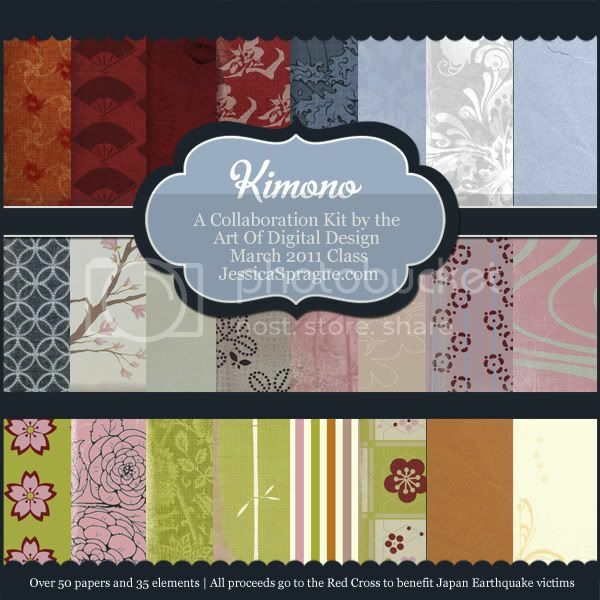 There are over 50 papers and 35 elements in this great kit created by the participants in the March 2011 Art of Digital Design class. I have also linked the photo, so you can click to photo to be taken to the kit in the store. While I did not get to create anything for the collab itself, I did create a quick page with some of the pieces, to show just what is possible from this gorgeous kit. I have included the bare bones version of the QP, so you can add your own title and journaling to fit your picture. I would love to hear what you think of the quick page and the collab kit. Please leave a comment below! So cool that you made a package of it. Love that!